Heading to Twickenham for the Rugby? Please do give us your feedback if you are there and are able to use any of the benefits. ThatT1Feeling, PETER01, corporate-wage-slave and 12 others like this. 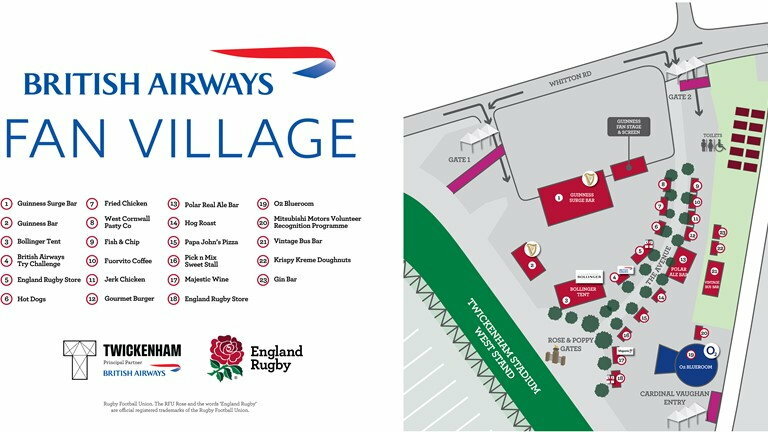 The Fan Village is by the West Stand, in the ticketed area, between entry gates 1 and 2 on the Whitton Road side. The BA Try Challenge is in marquee 4 next to the Bollinger Bar. BA Executive Club and navylad like this. Perfect timing, I'll be there on Sunday! dare I ask.... any guesting privileges into the lounge? As British Airways why only at Twickenham? are are they really English Airways? stevie, User Name, BlueThroughCrimp and 1 others like this. At a guess because they are sponsoring the England Rugby team. There are many in the English regions show would disagree with you. KeaneJohn, annihilation and ConfusedByBAEC like this. ratechaser and aidy like this. 2 for Gold Guest List Members? What are the opening times of the BA Lounge please? Before and after the game? Shame the link to https://www.shopping.ba.com/twickenham doesn't work, but I'm not surprised. One day, and probably only for one day, everything on the BA website will work. Sadly I doubt it will be in my lifetime. Didn't like Internet Explorer. Works on Iphone. Location: It's Grim Oop North! Programs: BA & A3 - Yellow and Shiny! Thanks for the information. Is this just for the Six Nations home games or for other England events at Twickenham too (specifically for me the HSBC World 7's)? This is great! Will be there for England - France on Sunday so sure to avail of it: is it confirmed that guesting can occur into the lounge? Seems like there could well be scope for an FT meetup! All times are GMT -6. The time now is 1:10 am.